Trimmed remaining glue blobs with dremel router and sanding blocks. Did a bit more prep sanding of the foam and vacuumed everything. 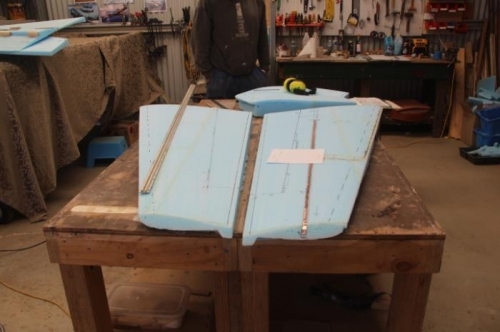 Hot glued wood strips to the back of the supporting blocks, and hot glued these to the table, with a scrap bit of foam glued between the lower winglets, because they were moving around annoyingly. Marked up the boundary of the BID for layup #3 and alignment marks for the UND. 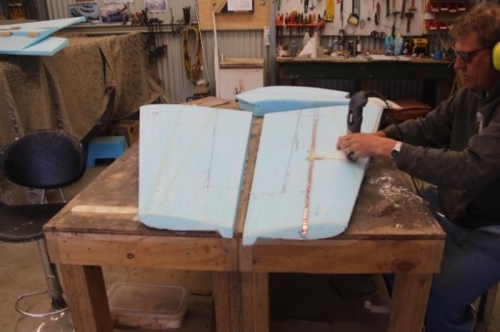 Cut 2" peel ply tapes for the leading edge and 0.8" tapes for the trailing edge overlap. Stapled the TE overlap tapes in place, and cut the glass, using scraps from the upper winglet single piece per ply allowance to cover both lower winglets with two pieces per ply. Cut the peel ply for the BID piece. Trimmed the lower Winglet top support blocks to prepare for skinning the other side, clear of the 2" overlap. Not quite sure what to do about the upper Winglet, the supporting blocks will be no use for this. Was keen to proceed to the layup, but it is getting late, and I haven't layup up anything for a while, I should be fresh. Later!